My sister has been living in Canmore, Alberta for 20 years. 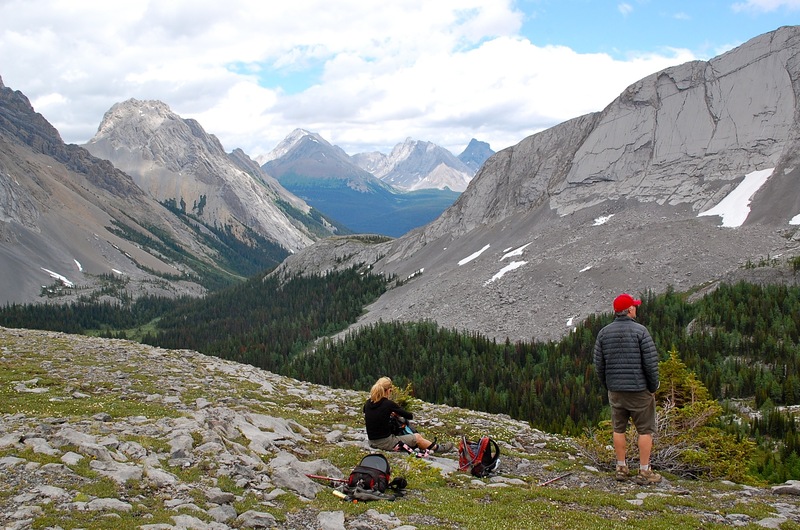 Her “go to” hike for showcasing the mighty Rockies is Burstall Pass in Kananaskis Country (or as the locals say, K-Country). She gets a lot of visitors to beautiful Canmore, and when they want to hike she takes them to Burstall Pass. The trailhead is a scenic 45-minute drive from town and the hike always gets rave reviews. This time, with my hubby and me in tow, was no exception. Be prepared to get your feet wet, and come along for the trek. The hike is 15 km return with about 450 m of elevation gain. I’d rate it as moderate. The trail is well marked and pretty easy going (I’ll get to the wet part in a minute). There are two sections of “steepish” uphill, but they’re not relentless. It took us about 5 hours walking at a comfortable pace and stopping at the top for lunch. Don’t get put off by the first leg of the hike along an old logging road. After about 3 km the road ends and you’re on a pretty single-track. Another kilometer brings you over a bridge into a vast, gravel-strewn valley with low shrubbery. This is where the fun begins. The valley is crisscrossed by a myriad of glacier-fed streams. To get to the other side you’ll have to get your feet wet. So, once you can’t find any more logs to cross or stones to step on, put on your flip flops and wade through the icy water. If you’re a little tired, this will wake you up! Forget about your numb feet and look up at the spectacular mountains and glaciers that surround the valley. Before you know it, you’ll be on the other side lacing up your hiking boots and working up a sweat on the first steep section. 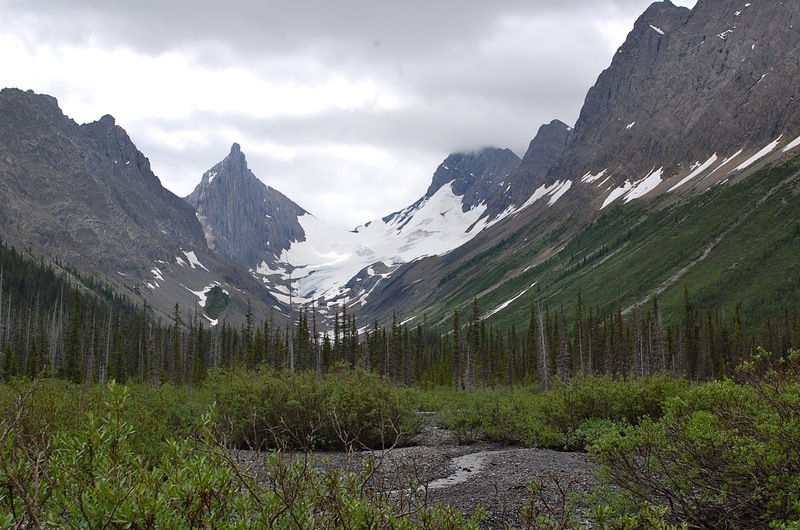 It’s only about one kilometer of huffing and puffing until you emerge on a lovely open meadow where you’ll get your first views of Burstall Pass. Enjoy the flat, scenic trail before the final push to the top that takes you above the treeline to a dramatic world of rock and ice. The ridge is a great place to hangout before retracing your steps back. There are lots of opportunities for further hiking from the top of the pass, but that will have to wait for another day. Once we’d had our lunch, the clouds were looking ominous. The overcast skies cast a stunning but menacing aura on the grey-hued landscape. We were feeling small and insignificant. Thankfully the rain held off and the only moisture we had to contend with was another crossing of the streams. To top off an amazing day of hiking we saw a black bear on the Spray Lakes Road. It was the quintessential Rocky Mountain experience. 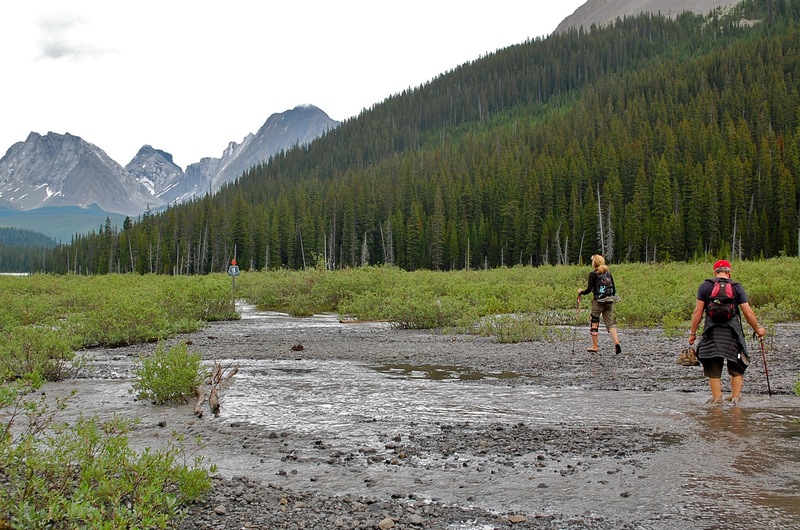 Take my sister’s advice: If you only do one hike in K-Country, make it Burstall Pass. 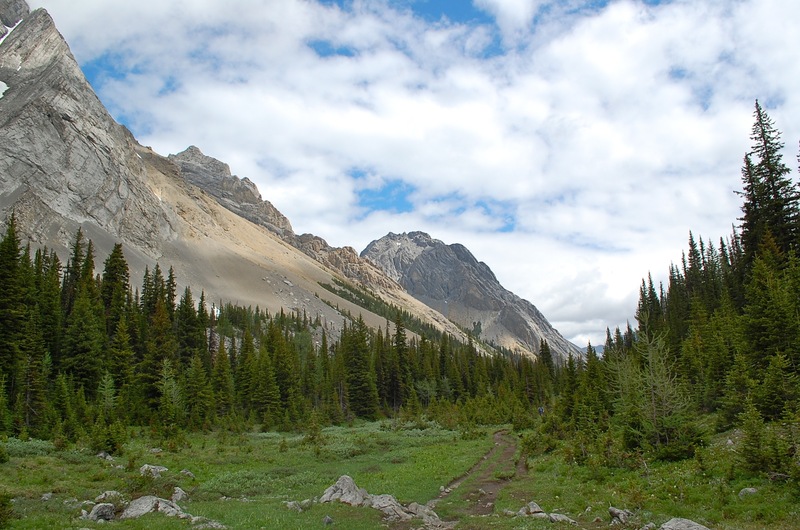 Canmore or Banff make a great base to explore Kananaskis Country and to hike the Burstall Pass. The trailhead is about 45 km from Canmore, south along Spray Lakes Road. There is a large parking lot beside Mud Lake. Spray Lakes Road is not paved, but no problem for a regular car. Bring flip flops or water shoes, I can’t stress this enough! It was a bit buggy in parts so you might want to pack mosquito repellent. As we experienced, the weather can change quickly. Dress in layers and bring rain gear. For another outstanding Rocky Mountain hike check out my post on the Iceline Trail in Yoho National Park—one of my favourite all-time hikes. Gosh, what a perfect capture of the expansiveness of the countryside. I’ll have to do this hike when I get back to Canada too! This is a really awesome hike with lots of variety. The stream crossings are all part of the fun. Thanks for reading. Cheers! This is a really awesome hike with lots of variety. The cold stream crossings are all part of the fun. Thanks for reading. Cheers! Oops…those comments below meant for you. Technology and me, not the perfect combo. 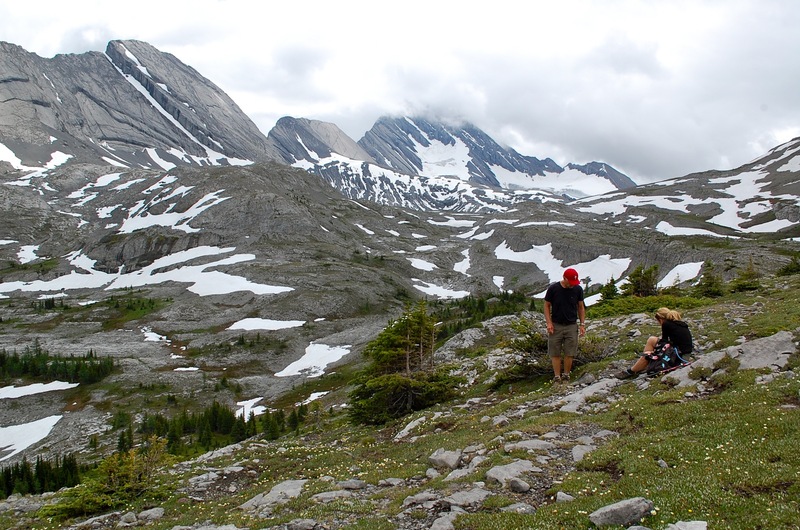 We love hiking in Kananaskis, and this one is a good one:) Lovely photos! Thanks! Although we live in a great place for hiking (Vancouver’s Northshore) I’d love to do more hikes in Kananaskis. This one really wet my appetite to go back soon. Thanks Alison. There are so many hikes to do in Kananaskis, I’m anxious to return. While I love our North Shore mountain hikes, the experience in the Rockies is very different…more open, less trees. Both great! Thanks for taking me along on this hike. Gorgeous country. I’d love to do it in real life – it’s exactly the kind of thing we love to do. Great photos.